6 days and counting down to the big month of RHYME! I can’t believe we get started in 6 days! Panic and excitement are starting to set in. I have had the kindest, sweetest, most wonderful comments from you all thanking me for doing this, telling me how excited you are and how you have been going to the library to collect your rhyming books, organizing desks, house cleaning and getting things done this week so you can fully commit next month! I am overwhelmed with happiness! But, you must know that I am as excited as you are! So, as I stared into my office with a grimace this morning, looking around at all the “stuff” that had migrated there, I realized it was time I move out of the living room and find my desk…so I got busy cleaning. My office is a small, spare bedroom where my youngest daughter used to live. Once my oldest daughter left for college last August, I swooped in and claimed it, moving daughter #2 into daughter #1’s bigger bedroom. She was happy, I was happy, daughter #1…not so much! With 6 people in a family, I declared that there shall not be a spare bedroom sitting empty when I needed an office! No democracy here! Now, it’s a spare bedroom/office/art studio/catch all. But, for the month of April, I have reclaimed my space! 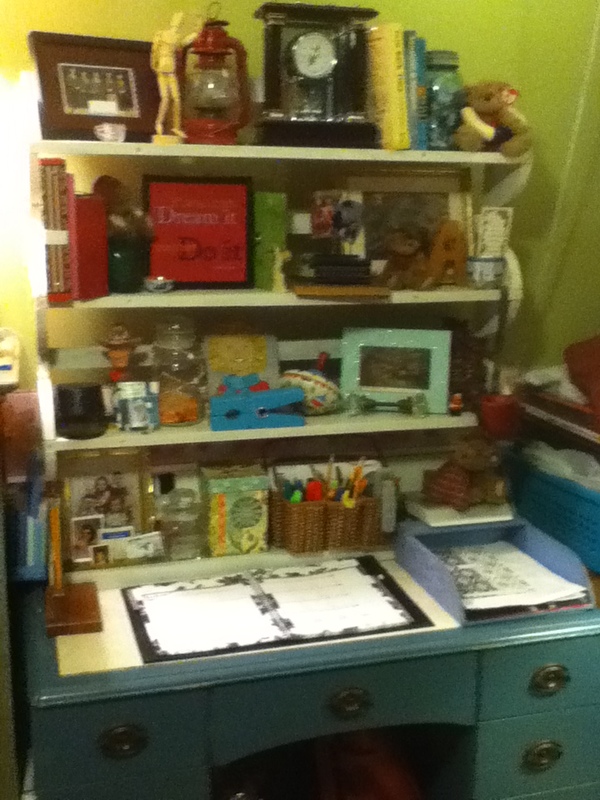 I thought I’d share a few pictures of my newly organized writing den…I don’t know about you all but when I organize…I want to keep gazing at it. So I thought I’d let you share in the gazing too! Look away if you don’t have time to organize…we all understand and won’t judge you! 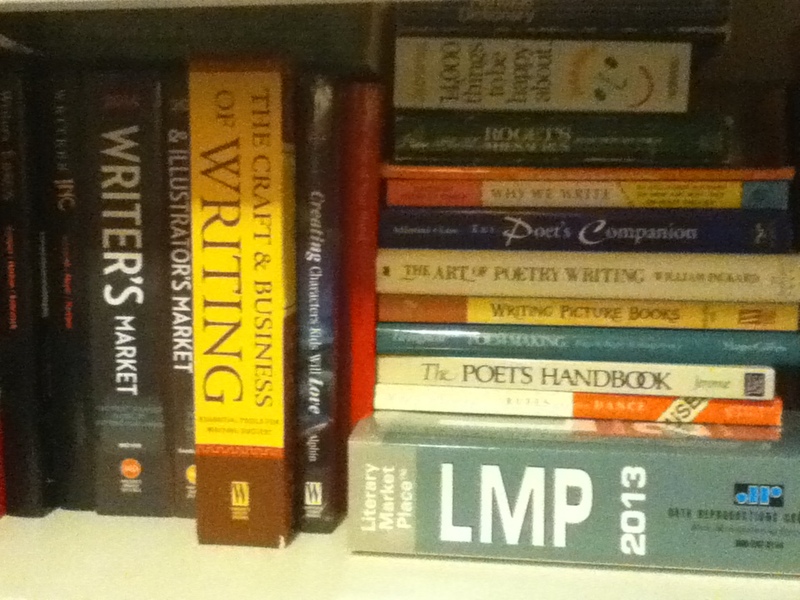 This is my writing desk. It’s an antique buffet that my mother had for years and I claimed it when she moved into a nursing home a year ago. It’s very old and on it’s 10th life, I imagine. 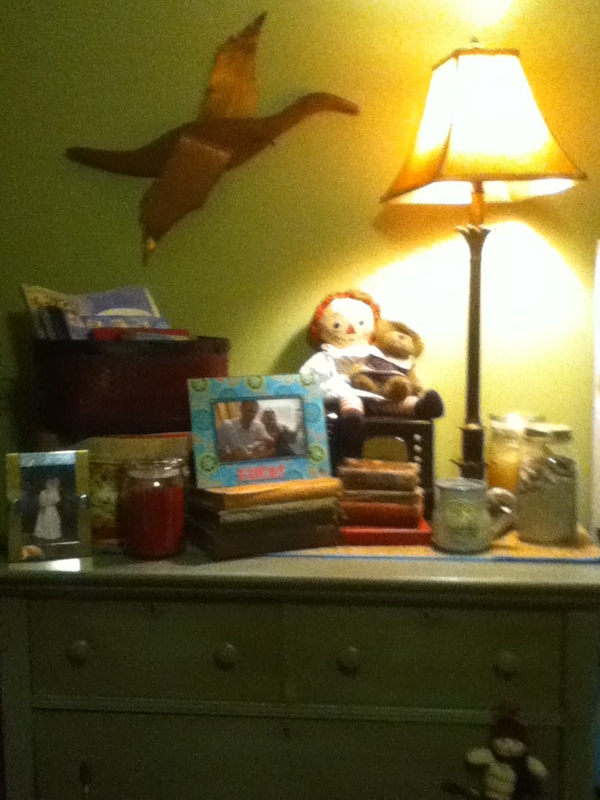 This is my childhood desk with way too many mementos but I am a total sap for meaningful nicknacks…my husband calls it junk. 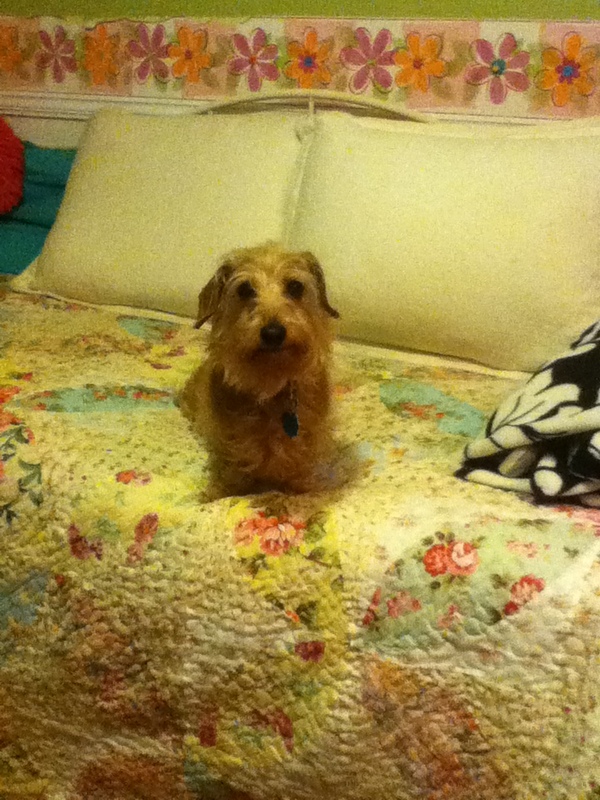 I tell him it’s an I Spy on my desk. Why does he put up with me? Can you find my Cowboy Jones Bobble head doll, my favorite cartoon painting of myself by Meg miller, my childhood bedroom doorknob, my “Good Things” Jar, a top that was mine when I was very young, Kit, the American Girl’s tiny typewriter that I stole when my girls outgrew AG Dolls, my favorite Walt Disney quote and my great-grandmother’s cuckoo clock. These are a few of my favorite things ! This is an antique chest of drawers that holds all my art and craft stuff. 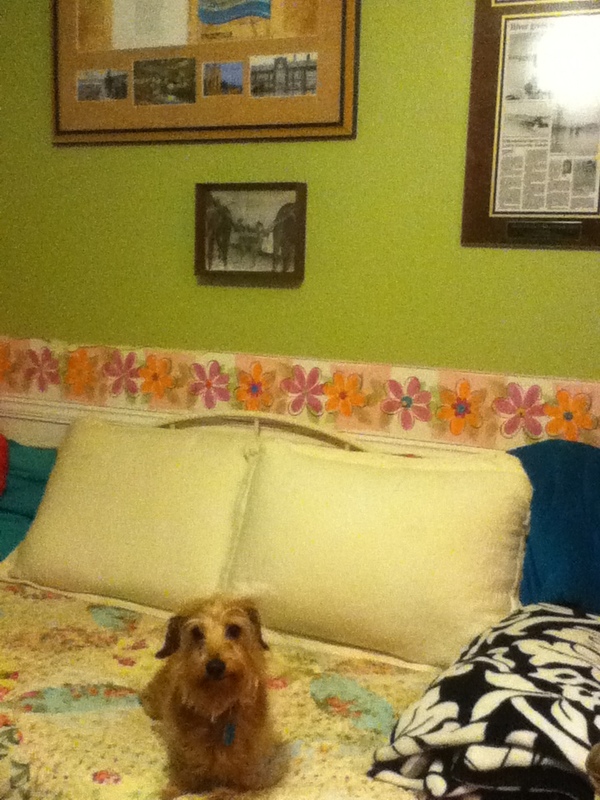 It goes with a 4 poster bed that was slept in by Charles Lindbergh. When and where, I don’t know, but that’s the story. It’s very old and I love it. 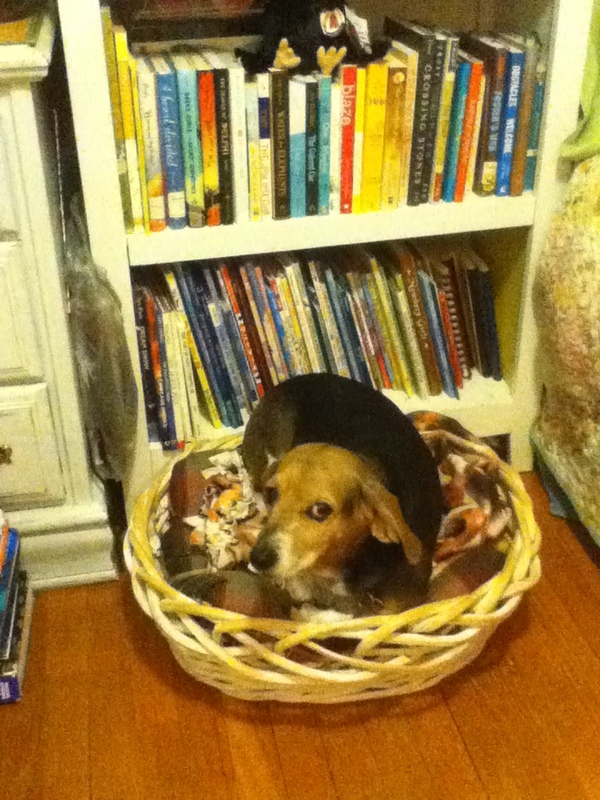 This is Lucy lounging on the daybed. 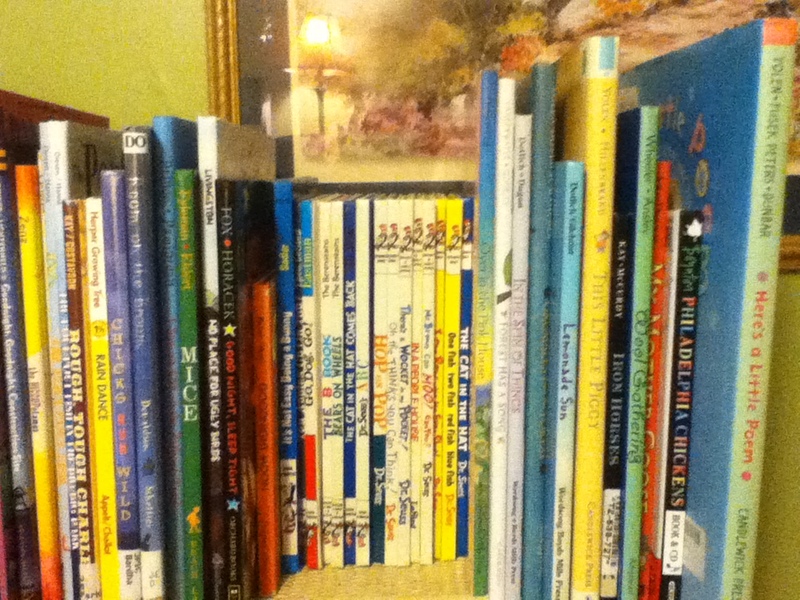 These are the picture books and resource books that I pulled out for April. 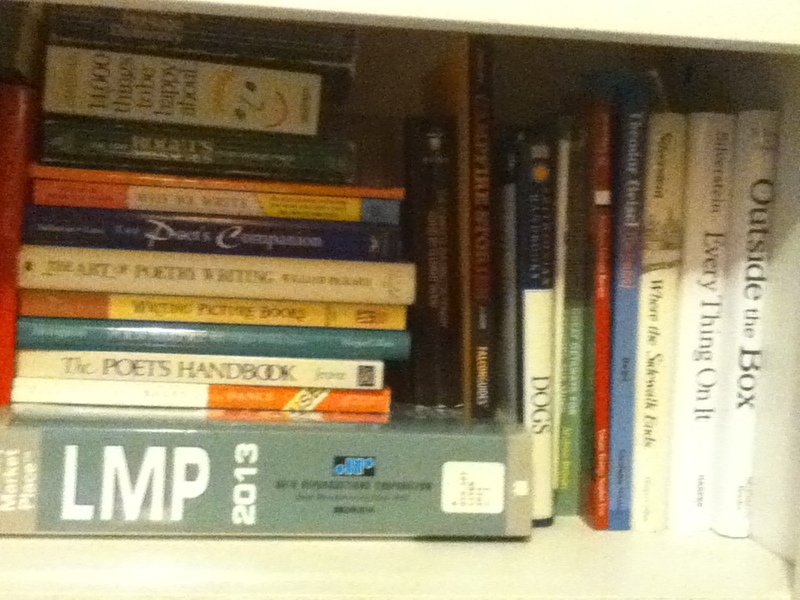 I have tons more books on shelves here and there but I gathered my favorite rhyming books and organized them here. 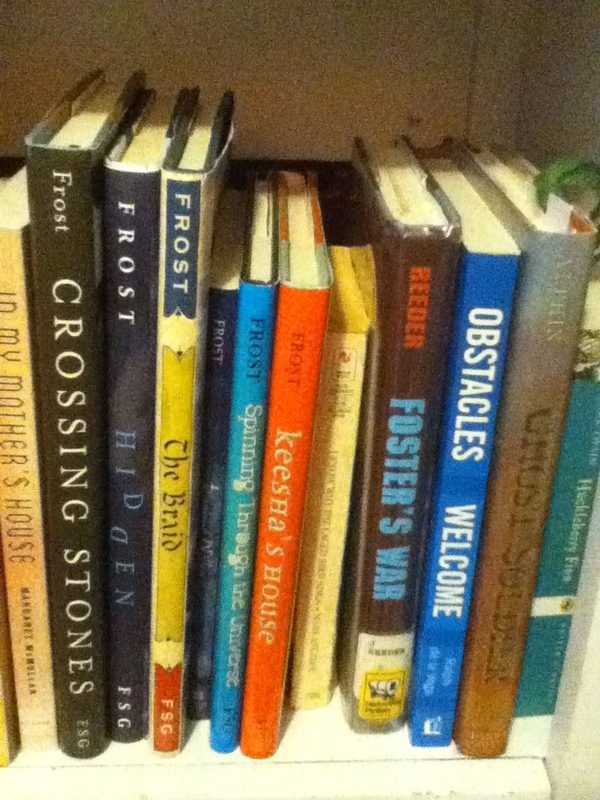 If you have not read Helen Frost’s books…you must! Well, this has been a tour of my office. I bet it won’t look this good by the end of April but I hope there will be lots and lots of poems written, picture books read and a rhyming picture book manuscript ready to submit to my new critique group! This is where I will be the whole month of April! Nice post with pics and SWEET dogs. 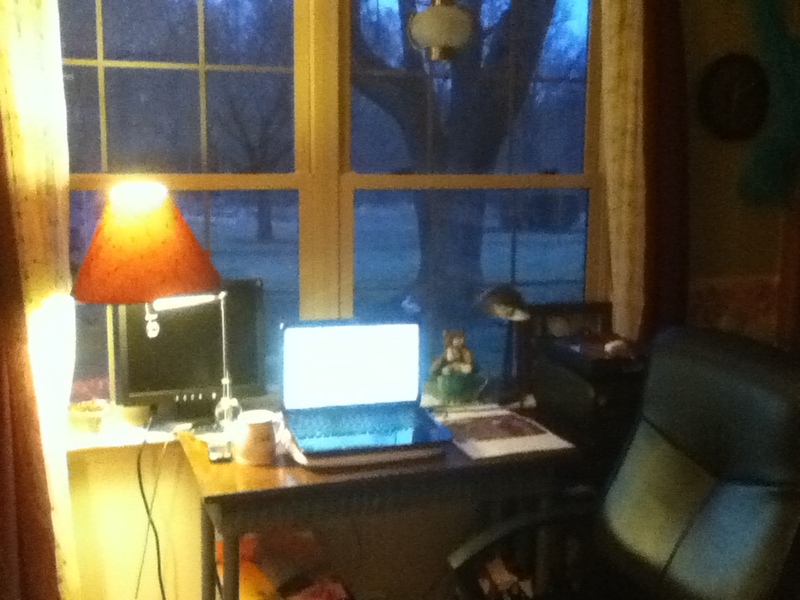 I have a new “office” that used to be eldest daughter’s room. It is all freshly painted in “crisp straw” with “racing orange” trim. Miraculously, all my old stuff seems to go just fine with this slightly eccentric color scheme. 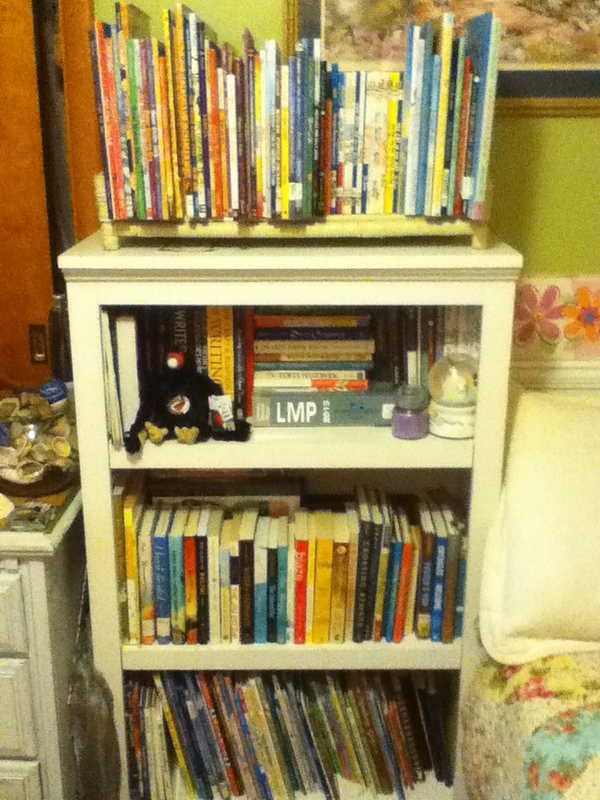 The pièce de résistance is a brand new book shelf built by my husband a few weeks ago. It will soon have a pile of rhyming PBs on it! Yes Robyn…I am magic! LOL And thrilled that you are getting them because honestly, I had no idea what to do to fix it! Did you do anything on your end? So glad it worked itself out! I loved having the opportunity to get to know you more by seeing your space. I so look forward to visiting with you at the Wow Retreat this summer. Me too Gaye! I can’t wait until that retreat! 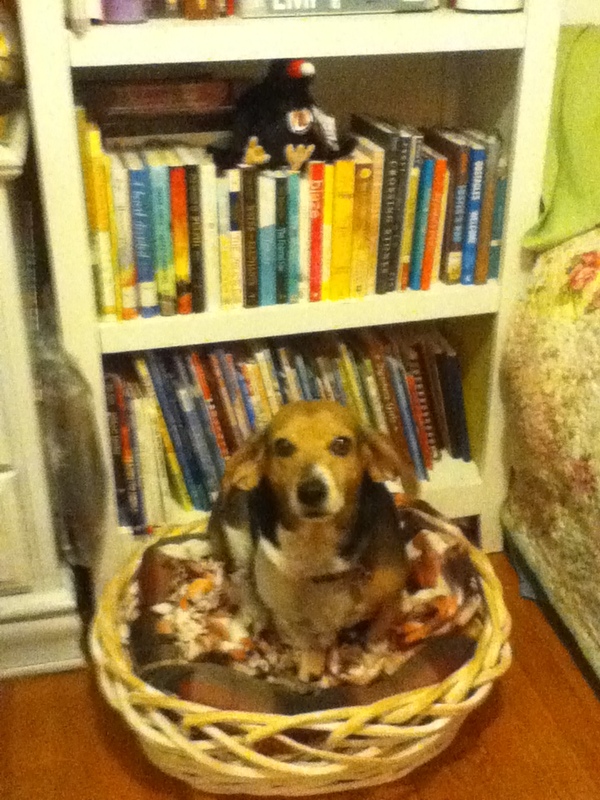 You have an inspirational writing space, Angie! 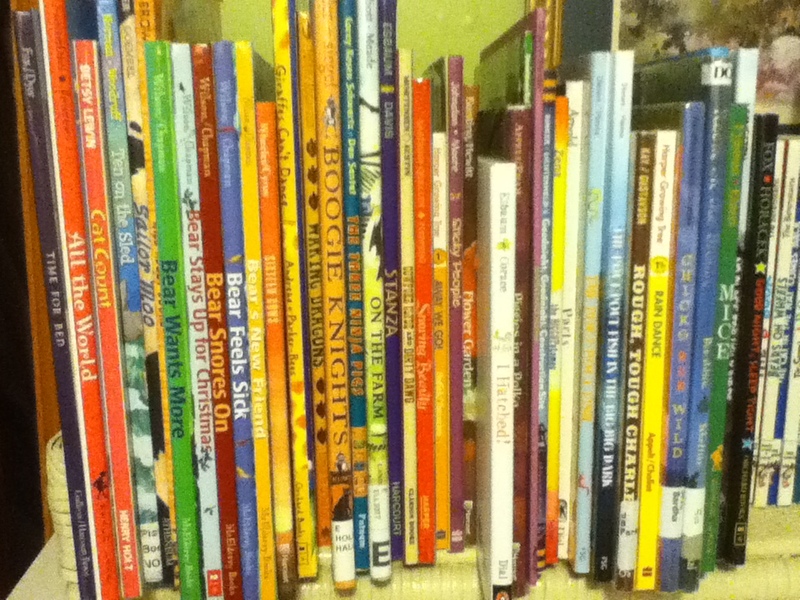 I recognize a lot of those rhyming picture books from my own book shelf, and I can’t wait to check out some new ones at the library during the month of April. Thank you for sharing your office with us, Angie. I envy you all the nice workspace. 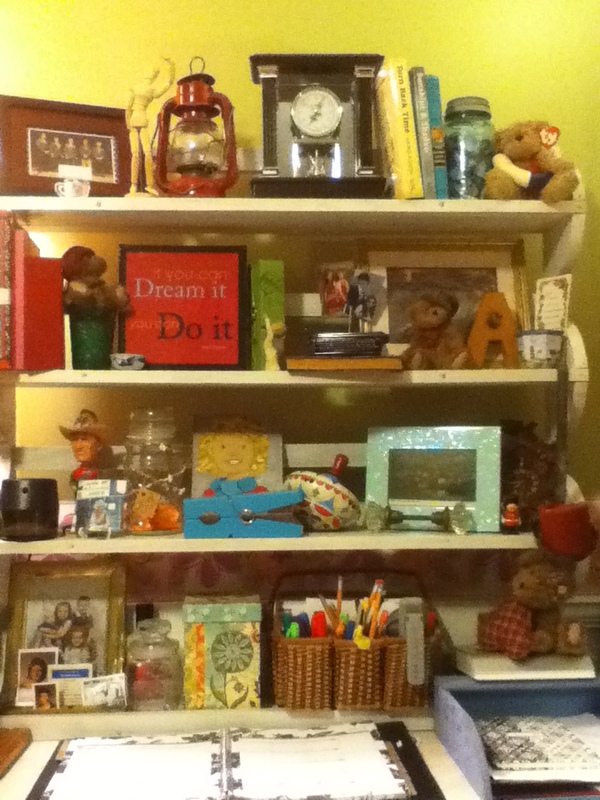 I love the pictures of your favorite things and the antiques:) I have a bit of this here and there-sorta spread out-LOL My family tolerates my writing and art supplies in all the nooks and crannies;) I need to do some cleaning before the adventure starts. I am looking forward to what is a new experience for me and I thank you for doing RhyPiBoMo! your office is neat and tidy compared to mine! Thanks so much everyone for the comments! This week has been so busy and it’s only Tuesday! I apologize for not replying to all your kind comments but my kids are home for Spring Break this week and my usual routine of organized chaos is terribly out of whack! I appreciate all of you for being here and hope to get to know you all better through the month of April and beyond! Hugs and Rhymes! PS- Lucy and Gracie are delightful! I’ve got four, 4-legged ‘office’ assistants myself.